This might qualify as the most boring home renovation post ever in the history of the universe, but, hey, it actually has historical precedent — in my house. 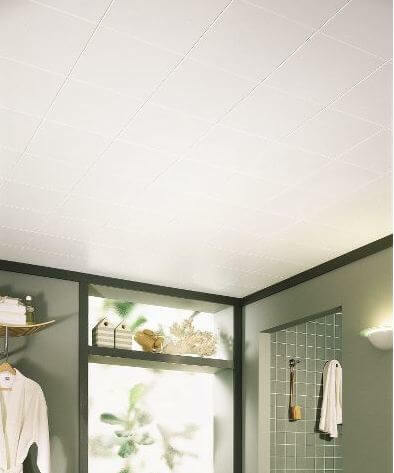 Yes: Plain white fiber ceiling tiles. That’s what was originally installed — and still is on the ceiling of our basement bedroom, which now serves as my husband’s office. 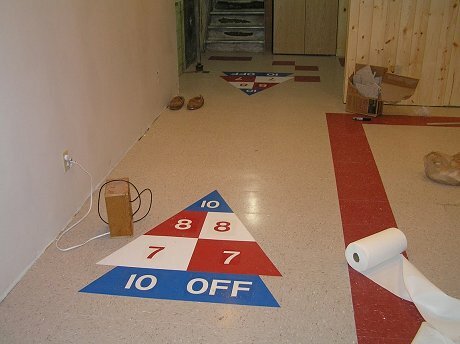 When we moved in, the same tiles were also in our basement TV room. There, we replaced them with a drywall ceiling when we removed spot lighting and updated the electric. Aesthetically, I prefered the smooth look of drywall in that space. But in the bedroom, we left the tiles as is, and they look just fine. We did repaint both ceilings Sherwin William beige, which reads “white” but much softer. Our basement is comfy cozy homey, with cherry paneling and gold carpet. Brite white would be so wrong down there. Note, the plain white tile ceilings in our bedroom (and before that, the TV room) were not “drop ceilings.” They were not “temporarily” covering plumbing or electric that might need to be accessed. They were hugging the ceiling (attached to furring strips) and meant to be fixed solutions. Nor do I think they are properly called “acoustical tiles” — that wasn’t their principal purpose. Do I “recommend” this look? I think the decision is purely a personal one. 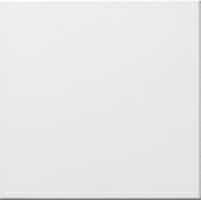 I found the simple white ceiling tiles featured here at Armstrong. I have these in my hallway. My mother had a craftsman style house built in the 20’s with plaster walls and ceilings. I remember she had these tiles installed in the whole house in the 60’srather than repainting the ceilings. once installed, they are maintenance free, She lived in the house until 2000, when she moved to assisted living. The tiles still looked good at that time. Are they still available, furring strips and all? Oh yeah, they are, in what seems all the original patterns. Armstrong makes them and maybe others. Lowe’s carries them and the furring strips are nothing more than 1 x 2s nailed to the ceiling or bare joists. My 1955 ranch is FULL of these tiles. Bedrooms, hallway, basement, livingroom-EVERYWHERE. Only, mine aren’t a subtle plain smooth white-and I wish they were. Some are perforated. They look like a white Lite-Brite peg board. Others have a heavy random linen-like texture. They are just stapled up onto thin furring strips right to the ceiling-GOOD ceilings. These weren’t put up to hide anything, but were the choice of the homeowner at the time. We needed to replace two ceilings because of electrical changes, damage and stains. In order to keep with the “original” look, we considered replacing the tiles. We found the same sort of thing at Menards, though, of course, not the same pattern/texture. The cost of putting up the stapled on tiles, and still using the existing furring strips was more than TRIPLE the cost of doing the job in drywall. I really preferred the drywall look anyway, but we did want to give the old original look a chance. But, this time a change of material, and letting the “old” go, was for the better. Ooops, I should have mentioned that we used the old furring strips to attach the new drywall. The strips were in good condition, solid and level. The only really time consuming and tedious part was that after the tiles are pulled down (yes, we used masks!) you have to go along and pull everyone of those danged staples out of the furring strips. We all had our pliers and a paper cup in hand. We plucked each staple and plunked them into our respective cup. With 3 of us working, it didn’t take too long. We have the exact same tiles in our basement – the lite brite ones. And when we moved in, badly smoke stained from a long time smoker in the house. My husband just painted them and they look great. I was worried the holes would fill in with paint, but no problems! These tiles are in our upstairs and I think they are h****** [edited]. However, we don’t have the budget to remove them and have drywall installed; so I hope that fresh paint will make them less offensive to me. How did you clean yours before painting? Ours were installed sometime in the early 1950s I’m guessing, and have some water stains from a leak somewhere along the line, in addition to 60 some odd years of collected dust and whatever. Or does anyone have any ideas of an inexpensive way to cover them without significantly lowering an already low ceiling that slopes with the roofline? drywall is only 5/8 inch can be screwed right thru them to the joists. OUr bid for drywall was not too expensive – they suggested drywall over the existing 50’s no demo costs. My 1947 home also has these tiles in the bedrooms, hallway, bathroom, kitchen and basement stairway. Thanks, Pam, for posting this as I have been wondering about them since we moved in! Our 1941 3 bedroom home has these in the middle bedroom along with painted, paneled walls. I’ve wondered about this, but have come to the conclusion that this room was used more as a “den” than a bedroom. Thanks, Lynne, for the update that doing it today in drywall can be cheaper than in tiles. Also, folks, remember my Precautionary Pam persona: Before you pull anything out — have it tested. Nasty asbestos and lead and lordy knows what else can be anywhere in these old houses. Good warning on the asbestos issue, Pam. Our last house, a 1913 foursquare had tiles added to the entry in the 50s (probably). We determined they had asbestos in them, so we opted to cover them with drywall and seal the problem in, rather than disturb the fibers by trying to remove them.